If you are a graduate from ANY of our Adult & Teen Challenge of Texas campuses, you and your family are invited to come and join us on Saturday, March 5th from noon to 5:00 p.m. at an Adult & Teen Challenge campus near you. 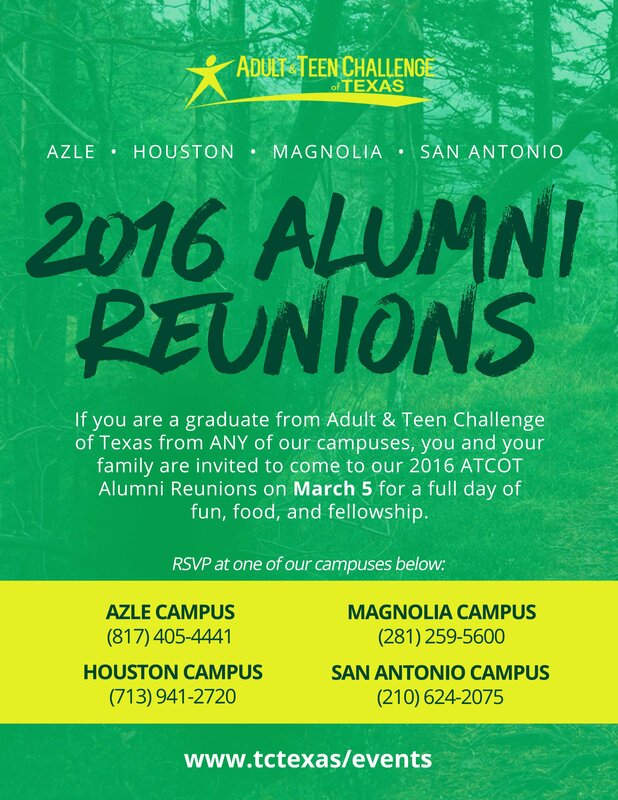 This year, four of our Adult & Teen Challenge of Texas campuses are hosting an alumni reunion including on March 5th including: Azle campus, Magnolia campus, Houston campus, and San Antonio campus. This is a time to reconnect with other Teen Challenge alumni and to find out what new and exciting things are happening on your former campus. You will learn about opportunities to stay connected to Teen Challenge after graduation. There will be music, games, alumni testimonies, and fun for the whole family. Don’t miss this awesome event to reconnect and fellowship with your Teen Challenge brothers and sisters.